Notice how the fortress protects the only entrance to the city and how there are steep “canyon” type rock formations all around. 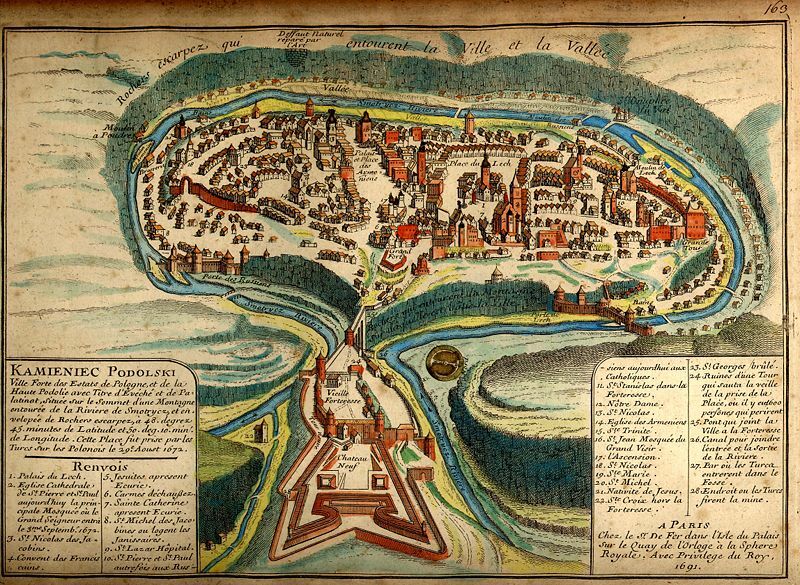 No wonder why this fortress was so important to the Polish and Polish-Lithuanian Republics–as well as to invaders. Today, the remains of this Castle/Fortress are very impressive, and it is a main tourist attraction of the city of Kamieniec-Podolski. We spent two nights in a hotel in this city and saw many sights in the area. I wrote a bit more about the city itself in a recent blog post here: http://poland.leonkonieczny.com/blog/?p=643. But this post and these pictures are about the castle. Wojtek and I spent about 1 1/2 hours here in the late afternoon, and the next morning we all walked down to see the Castle…. Yes, it was only a few blocks from the city center where our hotel was located. You can see my photos of this amazing place here: http://poland.leonkonieczny.com/Poland%202011/Kamieniec%20Podolski%20Castle-Fortress/index.html. Notice how it sits across from the old town, connected by a bridge. That bridge itself is considered a medieval feat of great engineering skill. And sitting high on a hill and overlooking the river far below gave it a great advantage over its enemies. To read more about this interesting fortress and it’s history, check out this Wikipedia article here. This entry was posted in 2011 Poland Trip, historic sites, history, Kresy, Ukraine. Bookmark the permalink.